- Absorbs oil, grease and solvents easily! NEED CLOTHS, WIPES OR RAGS? We have an extensive selection of commercial cleaning cloths, industrial cleaning wipes and bags of rags suited to every spill or mess. We have designed our cleaning cloths to be EXTRA THICK and EXTRA ABSORBENT to provide our customers with a value for money wiping product. We supply hospitality wipes, commercial cleaning cloths, healthcare wipes, automotive and industrial wipers, and many others suited to every professional wiping need in New South Wales, Queensland, Western Australia, South Australia, Victoria, Tasmania and the Northern Territory. Tiddox Disposables supplies cleaning wipes, cleaning cloths and cleaning rags to commercial and industrial organisations nationwide through its four distribution warehouses on the east and west coast of Australia. No matter the requirement or wiping application, as a specialist cleaning wipes provider, we will have the appropriate product to provide you with the best wiping solution. This website offers options By Industry, By Purpose and By Product. Alternatively, call us on 1300-TIDDOX (1300-84 33 69) or email us at sales@tiddox.com.au and one of our friendly customer service representatives will be able to assist you. We also provide private label manufacturing options on our product range. With technological advances worldwide, Australia has been rapidly transitioning from bags of rags, made up of used recycled T-shirt rags, to engineered synthetic wipers, manufactured purpose specific, with the added benefits of hygiene, consistency and greater performance. Leading the way is TIDDOX, a nationwide cleaning rags, wipes and cloths specialist, that started off as a textile rags supplier, importing containers of reclaimed WHITE COTTON RAGS and COLOURED T-SHIRT RAGS, that are washed, sorted, metal detected and packaged for distribution in 1.5kg, 5kg or 10kg bags. The past decade has seen a substantial shift in demand towards specifically designed commercial cleaning cloths and industrial cleaning wipes. These products are manufactured from combinations of viscose or wood pulp for absorbency and polypropylene or polyester for strength, and cut to varying sizes and thickness, packaged either in packs or as rolls of perforated wipes. The result has spawn a wide and varied assortment of task specific wiping products, designed and engineered with specific applications in mind, striving to provide a better experience and performance than a general purpose wiping solution. For example, in aged care, soft sensitive fabrics with extraordinary absorbency abilities are favoured, such as the TIDDOX's AGED CARE CLOTHS, which are versatile in use and cost effective. Many of the healthcare wipes are now also treated with an antibacterial agent, which slows the growth of germs and bacteria on the material. In addition, further hygiene measures have been incorporated into the new products, such as introducing products that are COLOUR CODED to prevent cross contamination from one area to another. Similarly in the HOSPITALITY INDUSTRY, most commercial kitchens strictly adhere to a colour coding system, ensuring that only green wipes are used in food preparation areas, and limiting red wipes to washroom areas, and blue wipes to the front of house functions of wiping down tables and counters. A huge trend has been in the increased market demand for DISPOSABLE WIPES, particularly in aged care and child care, as well as in the hospitality industry, which ploughs through disposable cloths to wipe down tables, kitchens and bar counters. Whilst many of the cloths can be washed and reused, in these hygiene sensitive environments, the preference is for disposable wipes, because once the wiper has been used and thrown away, so are any attached bacteria as well, thereby limiting the spread of germs. Another noticeable trend in manufactured wipes has been the bulk packaging of WIPES ON A ROLL as it reduces the average cost per use, making rolls the most economic wiping choice. 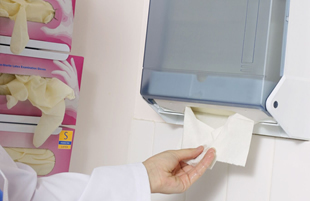 In organisations working within cost constraints or in high usage areas, TIDDOX'S JUMBO ROLLS are a very economical option, comprising anything from 500 to 1000 disposable wipers on a roll, which can be dispensed from a portable floor stand. Alternatively, smaller CENTREFEED ROLLS can be located for easy access in conveniently mounted wall dispensers. Whilst the workshop rag still has prominence in automotive garages and factories, we are now able to manufacture high performance, low lint, HEAVY DUTY INDUSTRIAL WIPERS which has been a game changer. 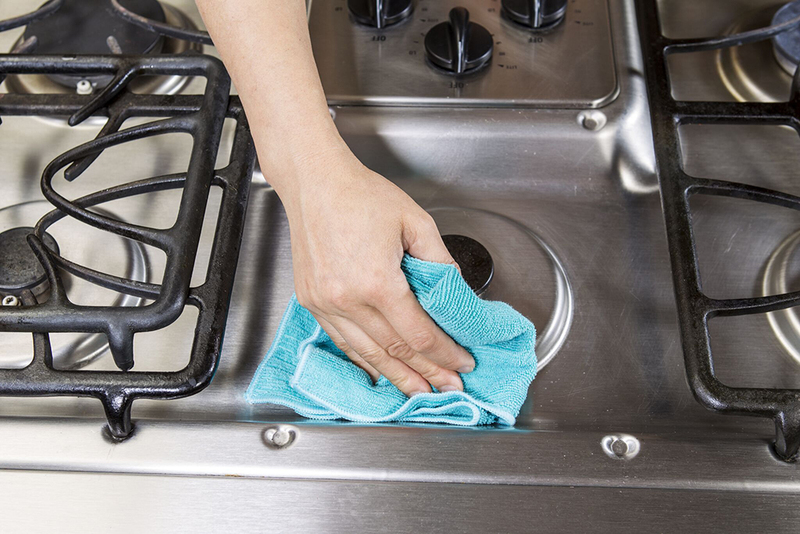 Particularly when surface preparation is lint sensitive, or metal and glass surfaces require a smudge free finish. By incorporating the desired characteristics into the manufactured material, we are able to produce the perfect wiper to fit the job! Furthermore, most of the manufactured products these days are SOLVENT RESISTANT, meaning that they work well with solvents and do not easily fall apart when used with paint, oils, fuel or chemicals. 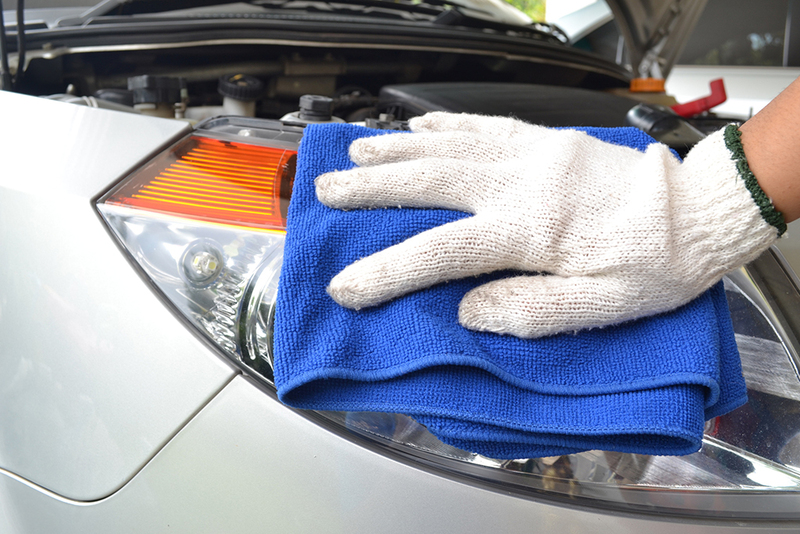 An added advantage is that the packaged wipes are not as bulky as bags of rags and are easily transported and stored. 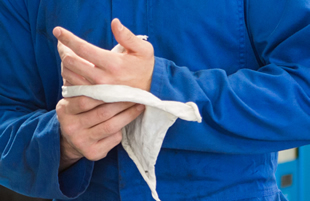 For certain speciality sensitive wiping tasks, such as wiping delicate print heads or use in sterile cleanrooms or controlled production lines, vacuum packed LINT-FREE WIPES ensure that the appropriate level of care is taken. These are often used in conjunction with FOAM SWABS as a gentle applicator or cleaner of sensitive equipment. The versatility and diversification of manufactured cleaning wipes knows no bounds, with a different product designed for each and every task. Not least of which are the LOW LINT WINDOW AND GLASS CLEANING WIPERS which ensure a streak free finish to glass and metal surfaces, including screens and monitors. There are also speciality SMOOTH SURFACED CLOTHS designed for polishing iphones, ipads, jewellery and lenses. For large floor and surface spills, where a vast quantity of liquid needs to be soaked up fast, the viscose component of the manufactured wiper is significantly increased, resulting in a rayon concentrated, THICK SPONGE CLOTH, that can absorb many times its own weight in liquid, that can also be rinsed and reused. These ultra absorbent drying characteristics lend this product to use in industrial settings and as a vehicle washing shammy. Because of these properties, smaller versions of this wiper, called TIDDOX MAXI WIPES, are used extensively in aged care, child care and hospitality where spills regularly occur and need to be soaked up fast. Perhaps one of the most common MULTIPURPOSE CLEANING CLOTHS are those made from microfibre material. Within this category weight, texture, pile and absorbency vary greatly depending on the end user application, which ranges from use in restaurants and kitchens, to janitorial dusting, through to automotive car washing. The above illustrates to some extent, how broad the design and engineering of manufactured wipers has developed in Australia, giving users a wide choice and speciality of cleaning cloths to best match their wiping requirement, far beyond that which traditional T-Shirt cleaning rags can offer.